Recently there has been a flood of puerile blackface pictures coming back to haunt public figures. Race does not play a big part in ‘The Ur Legend‘ and I like to write about current events that are relevant to my story. However ethnicity is prominent and ethnic prejudice draws from the same well as racial prejudice. But I really don’t want to give you my opinion on the specifics of the blackface phenomenon nor on the issue of racial prejudice in general. I simply want to offer up a reading list of what I consider to be the most insightful writing, for me, on the topic. Not ‘Soul on Ice’ nor ‘Black Like Me’ nor ‘The Confessions of Nat Turner’. First, everyone has heard of ‘Uncle Tom’s Cabin’ but I’ve found that few have read it. READ IT. It is a book with messages on several levels for an audience today. It details the conflicting views about slavery in both the North and South in the 1850s. Augustine St. Clare is a Southern slave owner who abhors the institution and his sister, Ophelia, a northern abolitionist with a distinct aversion to blacks. Its eponymous character, Uncle Tom himself, is, I believe, one of the most misunderstood in all of literature. His name has become synonymous with the image of a black man exhibiting obsequiousness to whites. I came to look at him as something far from that pejorative characterization. Tom was a man of deep faith and a non violent and loving spirit. He wasn’t pliant to whites because he feared them but because he loved them and his god. Tom was non violent in the best tradition of King and Ghandi. 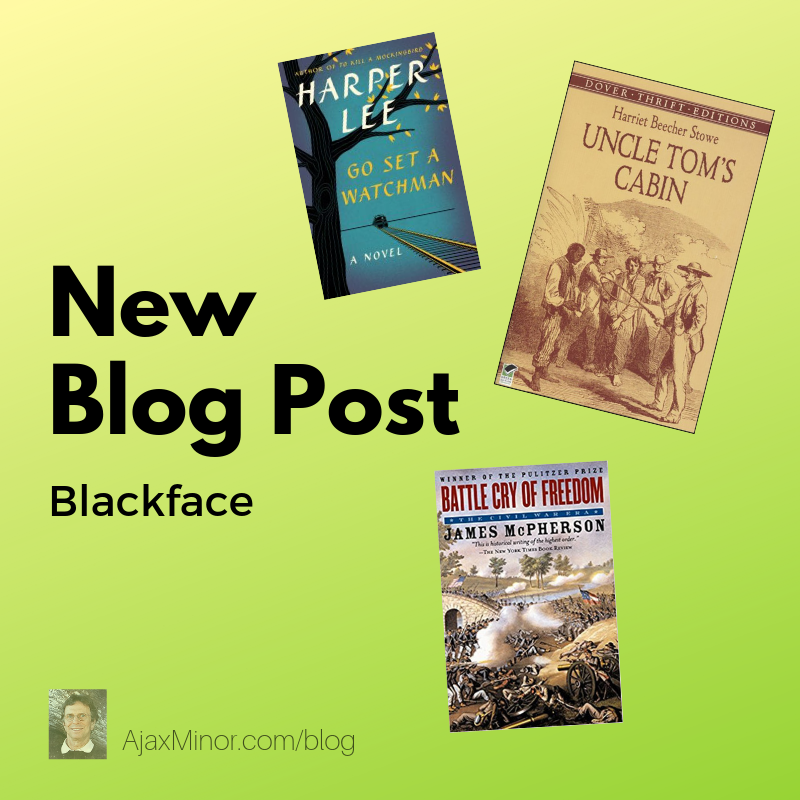 Next, to understand the culture of the South and have an appreciation of its pushback against Northern moralizing, which is not fed by racial bias, read Chapter 14 of ‘Go Set a Watchman’ by Harper Lee. Sure, most people have read the book ‘To Kill Mockingbird’, or seen the movie, and been inspired by the character of Atticus Finch. If you read the reviews of ‘Watchman’, you know many were disappointed, to put it mildly, at the older, more ‘prejudiced’ Atticus in ‘Watchman’. But read the conversation between Scout and her Uncle in Chapter 14 of the book. It speaks of the origins of Southern culture and is a more than instructive for us who were raised in the North. It dilutes our feelings of moral superiority. Finally, there is a running dispute about the causes of the Civil War. There are those who believe that the conflict was not really about slavery but rather about liberty. Or at least ‘negative liberty’, the freedom from being told what NOT to do, and elucidated by Scout’s uncle, Atticus’ brother, in ‘Watchman’. A Utilitarian might wonder what if the North had not pressed the issue of slavery and just let it die from natural causes, as it surely would have. That decision would have saved a quarter of a million lives at the expense of one generation of slaves. Just one generation. Easy to say. But the reality is that it would have done no such thing. U S Grant once remarked that once Texas was admitted to the Union a Civil War was guaranteed. Why? Because it expanded the area of slave ownership beyond the original 11. And with that was born the Missouri Compromise, Bloody Kansas and the demand of the South to be able to take their ‘property’ straight to the Pacific. Even if the Union had let the South secede peacefully there would eventually have been a conflict over territory in the Western U.S.
To gain more insight get ‘Battle Cry of Freedom’ by James McPherson, a brilliant book that served as the inspiration for Ken Burns’ seminal ‘Civil War’ documentary. If you’re not all that interested in the ‘Rebellion’ as the Confederacy called it, read Chapter 3, ‘An Empire of Slavery’. It’s a real eye opener. Some of the more radical in the South at that time envisioned an ’empire of slavery’ stretching west to the Pacific and South all the way to Patagonia. Enough of my writing. Time for you to READ!